In this book, you will discover how the health of your soul is the foundation to your overall health. Katie shares how to renew your mind and study God's word, which will change the perspective on how you see yourself, making loving yourself (and your body) possible. You will learn how to replace lies with the truth and shift your focus from what the world says to what God's Word says. In addition to the spiritual truths, you will learn how to nourish your body with clean eating foods and get practical tools that make healthy living enjoyable and maintainable. 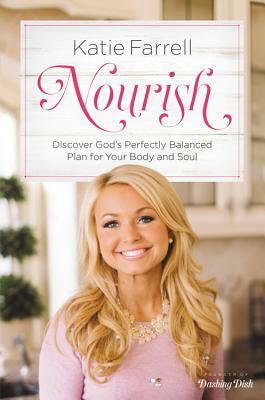 I loved "Nourish" by Katie Farrell. I cannot say enough good things about this book. From the beginning, Katie is transparent about her battle with body image, food and how she has had to wrestle with these things as idols rather than seeing the perspective God has of her. Until she got the right perspective, she knew that the outside would never reflect the transformation that Christ was looking to do on the inside. Once Katie figured out that looking good on the inside was a direct reflection of the inner beauty Christ was trying to do on the inside, Katie began to trust Him and replace the lies she has been telling herself for years. Packed with truth, recipes and advice, this book is encouraging for the woman who is looking for practical tools to live a healthier lifestyle from the inside out. One of the many things I loved about this book was the recipes. I struggle to find recipes that excite me or to find new ones to incorporate into my life that are easy and Katie was able to do that for me! I also loved the power and vulnerability that Katie has in sharing her testimony. Her story is inspiring, yet relatable and something that all women have experienced at some point or another. This is one of those books that you will keep on the shelf to bring on from time to time for different seasons in your life, daughter or granddaughter's life. I truly enjoyed this book. I give this book 5/5 stars. A favorable review was not required. Author of the Dashing Dish cookbook, KATIE FARRELL, is the owner of Dashing Dish Inc., a web-based nutrition business and ministry. After years of working as a labor and delivery nurse, Katie pursued her passion to help women get healthy and enjoy the journey. Dashing Dish is a place where women can find encouragement and fulfillment through a balance of healthy living principals and God's Word. Katie now works with clients through meal planning, teaching life skills for balanced eating and nutritional counseling. Dashing Dish provides custom build-your-own meal planning and grocery list tools, as well as an iPhone app for people on the go. 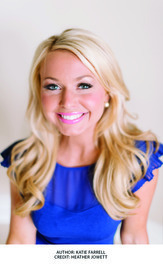 Katie also provides health and nutrition education to the community and speaks at women conferences nationally. Dashing Dish website has 30,000+ unique visitors per day. I love her blog! She is fantastic, Sarah. Thank you for the review. I just pre-ordered this book in time for Christmas.